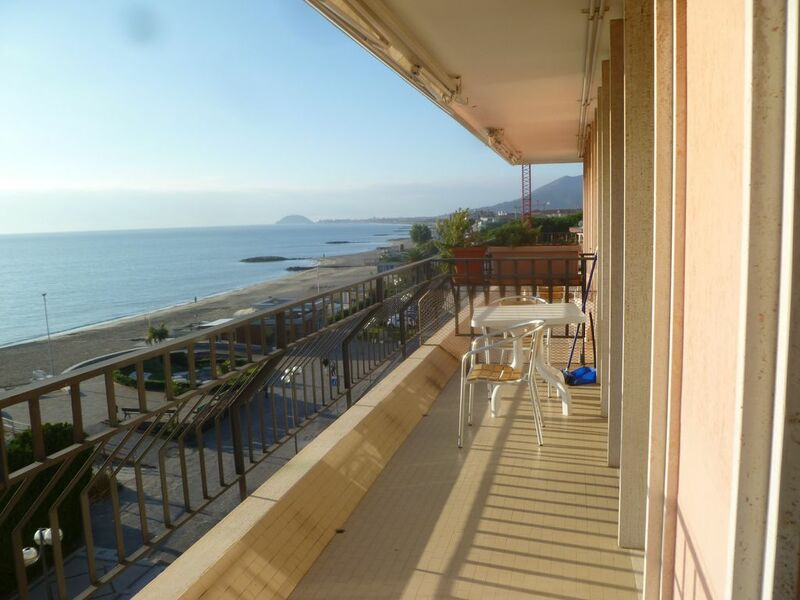 ENG: Bright studio at the 4th floor, situated on the Ceriale's prom can easily host 2 or 4 people. The large balcony as well as offering a wide view, Which on clear days offers a glimpse of the Corsica, Allows a pleasant outdoor living. In the 25 square meters apartment there are a double sofa bed and a sofa bed That contains two comfortable single beds. The flexibility of furniture can quickly transform the living area in the sleeping area The kitchenette comes equipped with dishes plates cutlery and table linen. The bathroom with all sanitary and large shower anche has an efficient washing machine. Microwave, flat screen TV and air conditioning / independent heating system will complement the offer. The central location and the parking space, reserved at the guest flat, Allows a great freedom of movement. ENG: The study position gives easy access to all aspects of life Ceriale. From the beach where you can enjoy all beach activities to the mountains That surround the town. Hiking, mountain bike and street bike are among the most popular. Not far from museums and the "caves of Toirano" that are cultural attractions not to be missed. Family friendly place, Ceriale is home to a large water park "The CARAVELLE". ITA: The location of the studio for easy access to all aspects of life in the town of Ceriale. From the beach where you can enjoy all beach activities to the mountains that surround the town. Hiking, mountain bike and street bike are among the most popular. Not far museums and cultural attractions Toirano caves are not to be missed. Family resort, is home to a large water park Ceriale "The CARAVELLE"
Monolocale frontemare (20 m. dalla spiaggia) attrezzato di tutto adatto ad una coppia con un bambino. Bellissimo grande balcone con tavolo sedie e sdraio. Condizionatore - Posto auto riservato. Proprietari estremamente gentili e disponibili. Lo consiglio. Siamo rimasti molto soddisfatti, il monolocale é molto luminoso e la vista dal balcone è bellissima! I proprietari sono cordiali e simpatici. Voto 10 !!! Direct aan de boulevard en aan het strand. Gezellig dorp. Goed eten. Monolocale ben organizzato con tutto ciò che serve ,terrazzo vivibile e vista spettacolare ,la spiaggia é dall'altra parte della strada a meno di 10 metri.Il signor Sergio é una persona molto disponibile e discreta.La spiaggia adatta ai bambini.Noi siamo stati benissimo e non vediamo l'ora di tornarci. Corrisponde alla descrizione, gradevolmente fresco e ventilato , proprietario disponibile! In addition to 'exposure to the sun, to the enjoyment of swimming in the sea, you can perform sporting activities in the water park "Le Caravelle", visit the nearby caves of Toirano, and do many walks on the waterfront and towards the mountains. You can easily reach the town of Sanremo. ENG: In Additions to exposure to the sun, to the enjoyment of swimming in the sea, you can perform sporting activities in the water park "Le Caravelle", visit the nearby caves of Toirano, and do many walks on the waterfront and towards the mountains. You can easily reach the town of Sanremo. Le tariffe sono comprensive dei consumi ad esclusione della tariffa mensile. Giorno di arrivo tra le ore 16 e le ore 19 e giorno di partenza entro le ore 10. Dopo le ore 19 del giorno stabilito per l'arrivo, non pervenendo alcuna comunicazione dal Cliente, l'appartamento si intende a disposizione di Questa Direzione. All'arrivo il Cliente è tenuto: alla consegna dei documenti d'identità, del codice fiscale ed a provvedere al SALDO.